A Brighton man sped away from police and hit speeds of up to 60mph, narrowly missing a cyclist and prompting a pedestrian to jump out of his way. He had been pulled over after wheel spinning in a Ford Focus car pumping out loud bass music. When two officers stopped him, they said that his car stank of cannabis. And as the police tried to talk to him, in the street outside Brighton College, he reversed away, span round and sped off. Dominic Dudkowski, prosecuting, told Brighton magistrates that the officers set off after the car but lost it as the driver raced along Eastern Road at high speeds. The speed limit is 20mph. Officers entered the first part of the car number plate into their police computers and suspected that the driver was Gavin Dawes, 33, from Brighton. They went to his home, in Playden Close, Whitehawk, where his mother lived, but were told that he wasn’t there. Shortly afterwards Dawes reported the car stolen. Solicitor-advocate Maria Higgins, defending, suggested that the officers had identified Dawes having seen his photograph on a police computer – not because they recognised him as the driver from “a fleeting glance”. Both officers said separately that they had had more than a fleeting glance and it had been plenty of time to register Dawes’s face. Asked why they hadn’t asked other officers for help to avoid compromising the identification process, they said that they had but no one else was available at the time. PC Richard Jackson said that it was vital to act quickly rather than wait for another officer to become free. PC Stephen Driver told Brighton Magistrates’ Court: “The vehicle was accelerating to a speed that we were unable to match. “I radioed for help. He narrowly missed hitting a cyclist by a matter of inches. Had he struck the cyclist I believe he would have been killed. “I saw a large male jump out of the road and take cover behind some scaffolding. PC Driver, the passenger in the police car, said: “The road conditions were wet. It was raining and it had been raining heavily. There was standing water in the road. He defended his decision to look at a photograph of Dawes as he and PC Jackson tried to work out the identity of the dangerous driver. He said that he was “100 per cent certain”. Mr Dudkowski, a barrister, defended the statements signed by the officers when they picked out Dawes in a video identification. And PC Jackson said that the Niche system used by the police did not allow officers to block images showing on screen with the information in someone’s file. 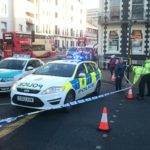 Dawes, now of Phoenix Rise, Brighton, denied a charge of dangerous driving at about 8pm on Monday 19 September last year. He said that he had been at a friend’s house. Dawes managed to find his stolen car which he had bought about a week earlier, he told the court. But Ms Higgins criticised the way that the police had identified the defendant. She said that the officers had admitted that this was the first time they had been involved in a video identification parade and not followed the proper procedures. Their mistake, in breaching Code D of the Police and Criminal Evidence Act (PACE), was so critical, she told the magistrates, that “you cannot be sure beyond all reasonable doubt that the defendant was the driver”. Nor could the officers be sure, she said, adding: “They saw the driver for only six or seven seconds – a fleeting glance. Those rules had been put in place to ensure a fair trial. The presiding magistrate Barney Miller said that the bench found Dawes guilty and described his alibi as implausible. They said that the offence and the manner of the driving was so serious that he should be sentenced by a crown court judge. Dawes was given an interim driving ban for six months which may be extended and remanded on unconditional bail to be sentenced at Lewes Crown Court until Monday 27 March.